As far as heavy-goes-it indie rock labels went in the '90s, San Diego's Goldenrod stable was one of the most approachable and consistent, pumping out roughly five dozen releases during their Clinton-era run, including records by several bands I've featured in past years including fluf, No Knife, Big Drill Car, Cars Get Crushed, Custom Floor, and Overwhelming Colorfast (nice run-on sentence, eh)? 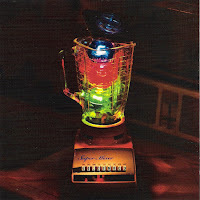 The 1996 Super Mixer compilation served as a representative label sampler and offered some sweet collectors bait, namely a lengthy, non-album rarity from No Knife, "Heavy Handed Man" and exclusive contributions from the rather unsung Tina, Age 13 (btw, does anyone have the Good Feelings album? ), ColdWaterCrane, Radio Wendy and 100 Watt Halo among others. We also treated to digital versions of songs otherwise only available on 7" by reluctant emo wunderkinds Knapsack, visionary popcore rockers Big Drill Car, and the lavishly decked-out pop punks known as Supernova. There are some other tasty morsels for your perusal hear as well. Super Mixer is a super way to acquaint yourself with a bevy of bands you likely didn't even know were walking the earth while you were too engaged with your Jawbreaker and Alanis Morissette records. You can check get caught up on Goldenrod's entire discography here. Oh! Forgot all about Goldenrod. Thanks for upping this. I do love me some Big Drill Car and still have a long sleeve red Big Drill Car shirt albeit it's got some holes. Thanks for this. Not my usual cup of tea, but happy to check it out. I actually have a few copies of the Good Feelings LP you asked about as well as a 7", both of which I bought up and treasure not because of the music so much, but because each individual cover was painstakingly hand painted and collaged by their now famous bass player/artist Chris Johanson, who has since gone on to international recognition with exhibitions in galleries and museums all over the world (including the Whitney Biannual.) Each Tina, Age 13 sleeve could be concidered an artwork to itself and is probably worth a lot more than the dollar bin [sorry guys] you see it in occasionally. As an aside, the music Is actually pretty good too! Every song sounds like either Quicksand, Helmet, or "if the band existed 5 years from 95" could have ended up on the Emo Diaries. Pretty damn good. 13 Keegan. I have an ep by them that's definitely not hand painted, but then again, it's actually a CD. Glad to hear you're enjoying this Rinjo. Knapsack and Boilermaker on the same comp?! I'm in! keegan- you're not willing to let go one of those copies of Good Feelings, would you?